Proofreading is a vital and important skill in the literary and business world. A proofreader must apply not only their understanding of grammar, punctuation and spelling, but also their understanding of how words should flow. It is their responsibility to recommend how to reword a sentence, paragraph or page so that what is meant to be conveyed is done so in the clearest, most pleasing manner. Knowing this, a proofreader is not just someone skilled in language and semantics, but also in the art of writing and speech as well. Therefore, this is a field of some specialism and complication, and must we learned as a science in and of itself. As with some other fields, proofreading is a permanent necessity in a society with written language. Regardless of the conditions of an economy or job market, proofreaders are always necessary wherever language is used – which is just about everywhere imaginable. There are very few companies in the world which do not employ a team of proofreaders. Copyediting is another field within proofreading that has just as much demand as general proofreading. A copy editor is responsible for applying changes which are recommended by either a proofreading team, or by their own judgment. Without copy editors and proofreaders, most written content in the world would have considerable level of typographical error, and would not read it has polished a form as it normally does. This is a vital task in business, communications and any other field in which language, especially written language is used. Those who have a love for writing, a love for language and literature, and an appreciation of speech stand to benefit from this lucrative field, while pursuing a profession that they would find very fulfilling. However, this is not a field which can just the entered without any training. Formal writing and language training are a major part of proofreading and copyediting, but there is more to it. There is a science to integrating these skills along with others. Therefore, if one wishes to enter copyediting or proofreading, they need a proofreading certification or copyediting certification. The best way to obtain a proofreading certification or copyediting certification is through online certification. Online certification has many benefits over traditional learning methods. Busy professionals can study a topic on their own schedule, giving them plenty of time to fulfill their personal and professional obligations which already exist. It is also considerably more affordable, eliminating costly tuition and book fees, not to mention the reduction of travel time to and from class. One important caveat for those seeking online certification, though, is this – there are many online certification providers, and some are bound to be far superior to others. Brainmeasures is the most superior online certification provider available. We are confident in our claims because of our unique, cutting-edge approach to presenting material to our students. We work with the highest quality professionals in designing our courses, and those professionals work with experts in fields we teach. These professional course designers and field experts work closely together, ensuring that our courses are inclusive of all the important material, and also that our courses provide real-world experience through examples in the material. 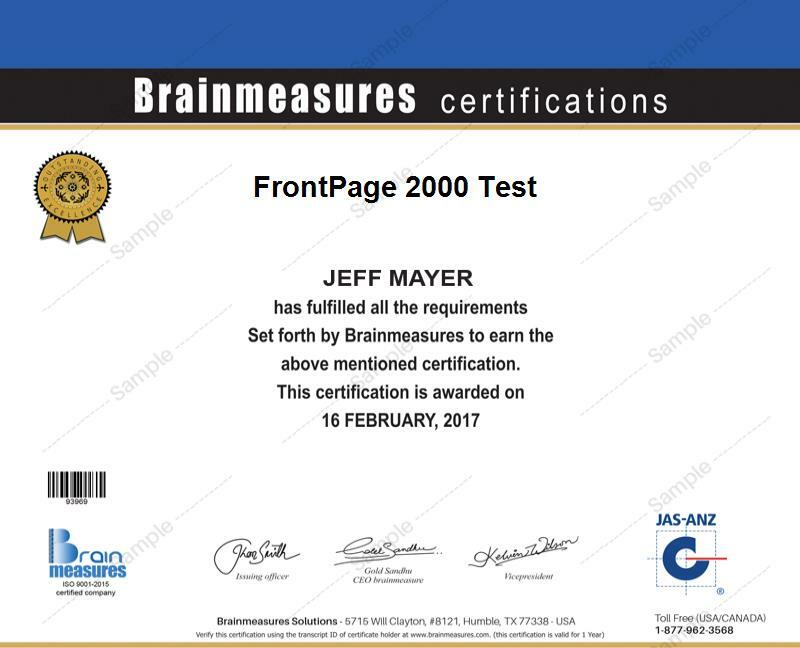 As a result of this cutting-edge teaching technique, students graduating with a Brainmeasures certification have a level of experience starting out that no other online certification provider could give them in 1 million years. This proofreading and copyediting certification consists of the proofreading and copyediting course, followed by the proofreading and copyediting exam. After passing the proofreading and copyediting exam, a certificate is awarded signifying a top-quality Brainmeasures proofreading and copyediting certification. This course is designed so that those with a love for reading, language and literature, and who are willing to put forth the effort can indeed study and pass this course. Many existing professions stand to benefit from this course and the way of improved efficiency and level of success, on top of the many employment opportunities this course may provide. While a few of these fields may involve independent contracts, and therefore be somewhat unpredictable, many others have in entry-level salary of between $100,000-$150,000 a year. With significant experience with a single company, however, many seasoned professionals in copyediting and proofreading may earn between $340,000-$510,000 a year, some even more.